Denver is doing well. A recent arrival to the Mile High City can vouch for Denver’s robust economy, quality of life, and even strong social connections. The Downtown Denver Partnership boasts that since 2011, a total of $4.4 billion in new development has been completed or is under construction in the downtown area, amounting to 73 projects, 3.1 million square feet of office space, 6,447 residential units, and 2,457 hotel rooms. A mostly youthful population of recent arrivals who thrive in the local commerce, cannabis, and high-altitude culture are easily embraced by those who have spent generations living along the “Front Range.” Denver’s current accolades also include a 2016 ranking as the best place to live in America by U.S. News and World Report. This year the University of Colorado A Line commuter rail opened, connecting for the first time the downtown central business district to the Denver International Airport, which in 2015 served over 15 million passengers. And yet, all of this revelry happens while many locals struggle with the tremendous pressures and growing pains associated with Denver’s rapid rise. A ride on the new A Line commuter train can cost up to $9. Granted this gets you all-day access to the entire regional transit system network, but can ordinary working class people really afford to get to work each day paying that amount? Denver’s established low-income communities in particular look and feel like a different world, as A Line rail commuters whiz by on the ever-expanding new modern public transit network, financed in no small part by a regional sales tax. Neighborhoods along the A Line rail are also home to the highest concentration of commercial marijuana grow facilities and experience the associated noxious fumes with each breeze. Longtime Denver residents readily acknowledge the decades of neglect that have shaped northeast Denver and their fears concerning new investments. Neighborhood leaders and local advocates regularly speak out to planners, developers, and elected leaders about the obvious twin pressures of gentrification and displacement resulting from a combination of multiple economic development legacy projects now expected to bring in over $5 billion of new public investment planned for northeast Denver. A stark view of the current situation by Caroline Tracey, titled “White Privilege and Gentrification in Denver, ‘America’s Favourite City,’” was featured recently in The Guardian. City leadership immediately responded, emphasizing Mayor Michael Hancock’s commitment to “development without displacement.” Denver social media took notice of the exchange and was abuzz with commentary and criticism. Facebook groups were formed with names like “Denver Fugly” and “Ditch the I-70 Ditch.” Those pages have a combined following of over 7,000 members and regularly voice strong opposition to the controversial major expansion of Interstate 70 and the expanding rash of what they consider questionable new architecture. Thousands of people are battling the market forces of unrestrained growth in order to hold onto not just their physical homes within the community, but their cultural identities, traditions, and heritage. Answers and solutions to the growth challenges are widely understood to be neither simple nor quick, and many people claim that their leaders and a majority, if not all, of profit-motivated developers are not responsive enough to concerns about displacement. The Urban Land Conservancy (ULC), where I am on staff as vice president of master site development, has successfully partnered with the City of Denver Office of Economic Development, local philanthropy, and for-profit developers to model specific place-based transit-oriented development strategies. ULC is also responding to the current crisis of a changing environment by initiating a more holistic approach in its place-based work to achieve equitable development and anti-displacement outcomes. One project in this vein that ULC is sponsoring is an inclusive creative placemaking vision in northeast Denver: the 303 ArtWay. The project is a direct response to community residents’ concerns regarding their lack of inclusion, feelings of loss in the midst of change, and the lack of existing physical connectivity from their neighborhoods to a new A Line rail station. ULC’s intent is to create a 9-mile art-, health-, and heritage-themed multi-use bike and pedestrian urban trail. It’s expected to feature authentic neighborhood cultural expression (a mix of Latin, African-American, and other influences), highlighting physical neighborhood assets and linkages to the new University of Colorado A Line. The first phase of the 303 ArtWay project will start at the 40th & Colorado commuter rail station and will end at Holly Square, a long-valued neighborhood center that has recently been revitalized through an inclusive community process. The Holly, as locals call it, has been transformed from an underperforming, obsolete retail shopping center that was damaged by gang arson in 2008 to a new children’s hub that directly serves the community’s needs. Holly Square now boasts a popular Boys & Girls Club and the recently completed Roots Charter Elementary School. The successful $14 million redevelopment of Holly Square resulted from meaningful and consistent community engagement over a seven-year period, with a deep commitment from residents and stakeholders in the Northeast Park Hill neighborhood. Ultimately the 303 ArtWay urban trail will physically weave newly created connections from 11 well-established residential neighborhoods to a variety of new social-impact-focused investments like The Holly and significant public destinations, like the Denver Zoo, the Denver Museum of Nature and Science, the iconic City Park, and the new 40th & Colorado A Line rail station. ULC and community partners are utilizing the 303 ArtWay’s arts and culture components to promote increased social cohesion and to address specific problems along the route, which has a history of gang violence and as a result, low public-safety perception. We are using creative visioning activities to fully engage stakeholders in determining what should be highlighted along the proposed trail. Students from Denver’s Metropolitan State University designed a custom reusable map display board, inspired by “Lite Brite,” that allows users to indicate (via colored pegs) their preferences among possible featured destinations along the trail route. Youth engagement has consistently increased thanks to the creative arts focus of planning work versus traditional methods of gathering input. 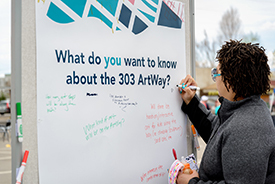 A community survey regarding the 303 ArtWay has been distributed and is currently approaching 1,100 respondents. The first ever 2015 Streetsblog Denver online poll designated the 303 ArtWay plan as the Streetsie Award “Project with the Brightest Future,” garnering the most votes of any project in any category. 303 ArtWay activities are coordinated by a group of three nonprofit core partners including ULC as lead project sponsor; Northeast Transportation Connections, a transportation management association focused on ArtWay community engagement efforts; and PlatteForum, an award-winning organization that supports local contemporary artists and underserved youth, focused on ArtWay arts/culture integration. As ULC’s point person and creator of the ArtWay concept, I drew on local community concerns and formulated a solution to those concerns based on my prior exposure to reimagined infrastructure and development, which was inspired by my friend and fellow dreamer Ryan Gravel. His ideas and work on the Atlanta BeltLine are now captured in his book, Where We Want to Live: Reclaiming Infrastructure for a New Generation of Cities, released in March 2016, As a result of embarking upon this collective work, all three core ArtWay partners have come to realize and grapple with the challenges and nuances of a public input process. Soliciting, facilitating, and documenting a real and authentic representation of local multicultural identities is not quick, and the results are not easily translated to visual form. Managing community expectations also requires consistent communication so as not to create improbable or impossible plans that are not viable and therefore infeasible to execute. Building and earning widespread community trust is often a challenging experience for everyone involved. Early on, one neighborhood leader questioned whether the project was an attempt to rebrand their community. The concern was well founded, since previously long-standing Denver neighborhoods have been repositioned, redeveloped, and renamed in the past. For instance, a predominantly Latino neighborhood known among residents as “Northside” is now readily (if incorrectly) referred to by a newer population as the Highlands, Lower Highland, or even as LoHi. However, some honest communication regarding our efforts to foster unity among the people living in 11 variously named neighborhoods along the proposed 9-mile loop of the ArtWay and the practical strength of the 303 brand as Denver’s main telephone area code seems to have neutralized the potential negative perception. Collaboration among internal core partners has also included moments of tension, including a time when it was suggested that we internally create and publish a proposed list of community heritage assets based solely on our own research. It was further suggested that as ULC team leader, I should prioritize that list based on my own perceived order of importance to the communities. After several thoughtful discussions and some healthy internal debate, we reached a group consensus to always seek input from community stakeholders in any matters related to selection of or priorities around local culture, historical significance, or artistic expression. ULC considers this decision to be fundamentally appropriate for a process that prioritizes inclusion, belonging, and creating a meaningful role for residents in making important decisions. Place-based art reflecting a balanced combination of African-American and Latin influences, which are the dominant local cultures of the residents in the neighborhoods east and west of the rail station. An art installation that promotes a theme of unity between the two communities. An art creation process in which the artist engages the local community, gaining a high level of acceptance and connection by local residents, causing positive thought, reflection, and inspiration concerning their place in the midst of the rapid socioeconomic changes happening across the larger northeast Denver area. An artwork that authentically reflects the results of engaging with both communities. Support for the project is emerging from many directions. Several local Denver design and engineering staff members of the nationally respected consulting firm HDR Inc. have recently offered their professional expertise to assist and advance the technical planning aspects of our implementation efforts. 303 ArtWay representatives are currently participating in Denver’s active planning efforts, such as the 40th & Colorado Transit Station Next Steps Study regarding multi-modal transportation connections, and the Platte to Park Hill Storm Water Project, a $298 million public infrastructure upgrade. As I write all this, an email request arrives from Prodigy Coffee, a recently opened nonprofit coffee bar with a vibrant original exterior mural along the future 303 ArtWay near the new 40th & Colorado station. Prodigy provides desperately needed apprenticeship training, jobs, and business skills for low-income, at-risk people between the ages of 16 and 24 who live in the area. A current Prodigy apprentice, who is the only employed member of a four-person family that includes two disabled individuals, is urgently in need of a new home since the family’s rent has been raised beyond its means. I can only offer the distressing news that area subsidized rental housing that can accommodate four-person households is extremely rare and most affordable communities are fully occupied with a long waiting list. Is there worry that the Artway project will itself lead to further displacement? Not really. The project is the least of the neighborhoods’ immediate concerns. Any ripple effect of the project on housing prices would be immediately dwarfed by the $5 billion worth of existing major infrastructure projects, including the new A Line commuter rail and the reconfiguration of Interstate 70. Also, it’s projected that a Corridor of Opportunity plan will bring in nearly 40,000 new jobs through new and expanding businesses. Realization of the ArtWay project can connect existing low-income residents to the transit and job options that are arriving, while simultaneously honoring the identities, cultures, and histories of longtime residents and their own social equity goals. 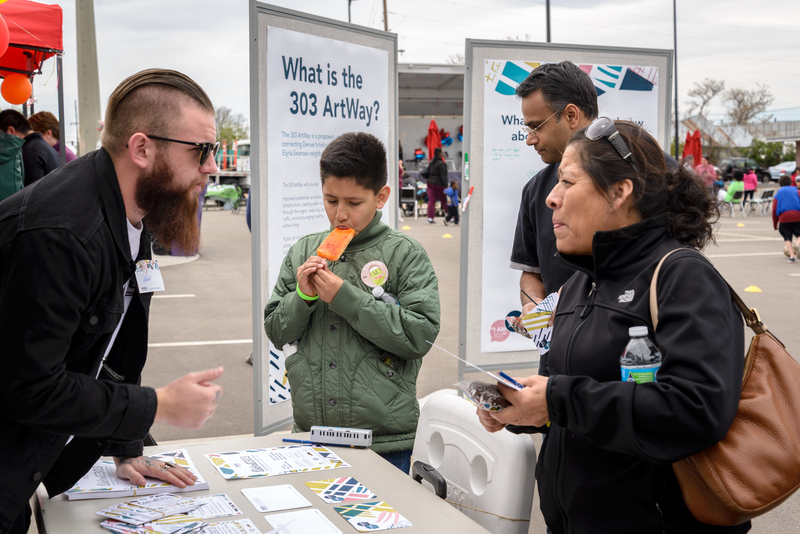 While excitement increases about the potential of the 303 ArtWay project, simply coordinating the efforts of all parties requires dedication and deliberate intent to engage in a transparent manner directly with affected community residents. Time is short since the physical and cultural displacement accompanying Denver’s change is rapid and often final. The equitable Denver we seek to achieve with access and opportunities for everyone can only become a reality if our leadership is committed in both strong words and swift actions to find time and resources appropriate to the task.